Raaga.com: Gemini studios’ CHANDRALEKHA was bigger than SS Rajamouli’s BABHUBALI! Gemini studios’ CHANDRALEKHA was bigger than SS Rajamouli’s BABHUBALI! 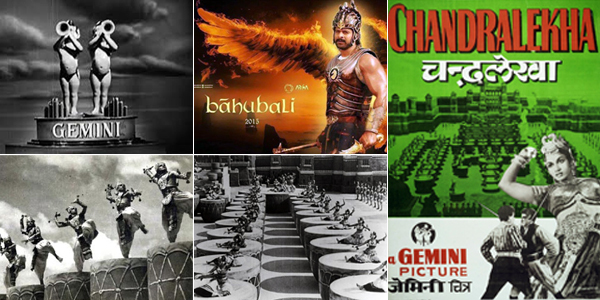 As the nation desperately awaits the release of SS Rajamouli’s BABHUBALI, touted as India’s most ‘costliest film’ made on mammoth budget of Rs 195 crore Raaga.Com takes its readers memory down lane and enlightens about India’s First Most ‘Expensive’ Indian film. Any guesses which is that film? No, it is not Mehboob Khan’s MOTHER INDIA or Raj Kapoor’s AWARA or K.Asif’s MUGHAL-E-AZAM but readers would be surprised to know that the First Most Expensive Film ever made in India was a Tamil Film called CHANDRALEKHA (1948). The film was produced by Gemini studios and directed by S.S. Vasan! The film featured M.K. Radha, Ranjan, T. R. Rajakumari, N. S. Krishnan and T. A. Madhuram in lead roles. Later it was remade in Hindi by the same team with minor changes to suit the Hindi audience taste. Interestingly like BABHUBALI, CHANDRALEKHA was a period film and was packed with war sequences and sword fight sequences, which are till date considered as the best and longest fight sequences shot in Indian film. Made on a whopping budget of Rs 30 lakh, (Almost 200 times more today) the film was made on a huge scale with lavish sets like extravagant palaces, splendor moat and draw-bridge strong enough to withstand the weight of horses, riders, crowds etc. The other highlights of the film being the famous drum–dance sequence which had such huge drums that hundreds of artists were used to dance upon the drums. The other attraction being the circus sequences used extensively in the film’s plot that became so popular that a circus company named its circus as Gemini Circus and it is in existence till today. It took five years to finish the production works of this film. The film began in 1943 and was released in 1948. The movie was super duper hit all over India and was also dubbed in foreign languages like English, Japanese and Danish and did brilliant business. CHANDRALEKHA was selected by the government of India for exhibition at the Fourth International Film Festival in Prague in 1949. The other land mark of the film is - the film was screened at 10th Chennai International Film Festival in December 2012, celebrating 100 years of Indian cinema and a postage stamp was released featuring Vasan and the drum dance to commemorate the 35th anniversary of the legendary director. Shahid Kapoor’s Wedding Card leaked!